No matter if you are young or old, a beginner or an advanced player, you’re going to find lessons here that will help take your playing to the next level. 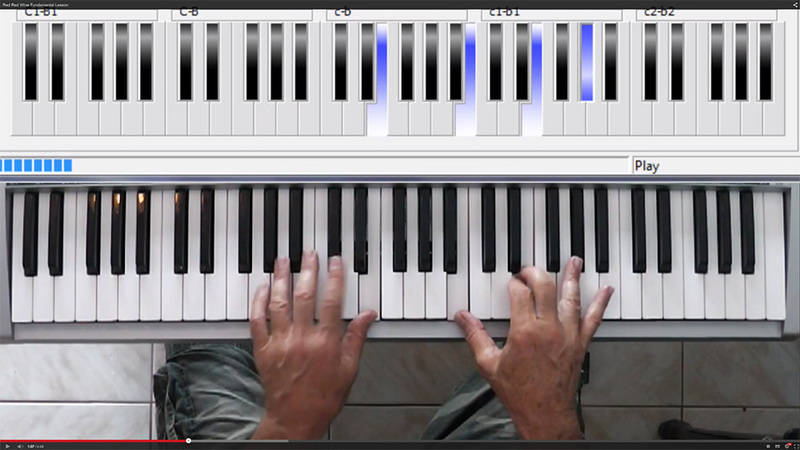 The ‘Free Demo’ will let you see the ‘double-keyboard’ display I’ve developed and I’ll talk you through my approach to teaching piano by teaching songs. It’s a time honoured tradition. The sort of music I love to play has always been handed down from one generation to the next by playing, listening and watching. ‘Reading the dots’ or notation doesn’t capture the feel in the same way. Or you can go to one of the ‘Free Tutorials’ and work through one of the lessons and see how it feels to learn this way. You can download lyric sheets and chord symbols for every song and there’s the option to send me a request for songs that you’d like me to teach. Our song list will show you the lessons that are currently available at the site and we are always adding new material.